Charleston, SC (May 9, 2017): David Weekley Homes, the nation’s largest private home builder, is celebrating its 20th anniversary of building homes in Charleston. Since launching in the oldest city of South Carolina, nearly 1,400 homes have been sold. Today, David Weekley Homes builds in five communities in the Charleston area, offering single-family homes and townhomes ranging in price from the $250s to the $1 million+. In Carnes Crossroads, homebuyers can choose from one- and two-story homes ranging from 1,700 to 2,500 square feet of living space. Starting from the $290s, new homesites are available in the newest section of St. Thomas Park. Residents of Carnes Crossroads enjoy the small-town setting where homes are in walking distance of parks and large lakes that dot the community. Amenities include a new 25-meter swimming pool to accommodate competitive and recreational swimming, a children’s play area and beach entry. Homebuyers will have more to choose from in Carolina Park when a new phase opens this summer. Currently, this master-planned, Mt. Pleasant community offers single-family homes starting from the $410s. Buyers can choose from one- and two-story options with 1,500 to 3,000 square feet of living space. This amenity-rich community includes a junior Olympic swimming pool, splash zone, open-air pavilion with a catering kitchen, picnic tables and fireplace, tennis courts, playground, and miles of hiking and biking trails. Residents in Carolina Park can explore 80 acres of parkland and 220 acres of preserved wetlands. Students attend Mount Pleasant schools. 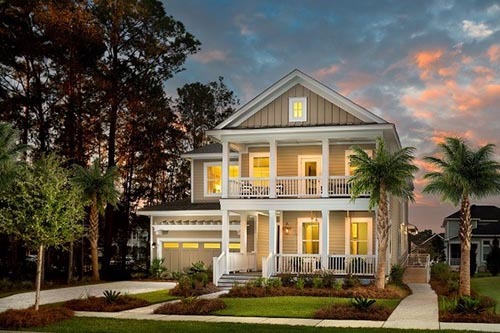 In Daniel Island, David Weekley Homes has completed the first of four buildings, which consists of four row homes each, in Daniel Island Edgefield Park Row Homes, with homes starting from the $635s. Three additional collections, including Daniel Island single-family homes, Daniel Island Park Custom Classics and Ralston Place Townhomes, are also available in this northeast Charleston community. Located near I-526, these homes start from the $515s to the $1 million+ and range from 1,700 to 4,000 square feet. Known as Charleston’s only island town with a lifestyle like no other, residents here enjoy 23 miles of rivers and tidal creeks, lush natural areas, community pools, and access to beaches and downtown Charleston. Also located in northeast Charleston, Weekley has limited opportunities available in Timbercrest Village at Tanner Plantation. Prospective buyers can choose from six move-in ready, or ready soon, showcase homes ranging from 2,000 to 2,500 square feet. Starting from the $270s, Timbercrest Village at Tanner Plantation is close to I-526, I-26 and Charleston International Airport. Rounding out Weekley’s offerings in Charleston is its Build on Your Lot Program where homebuyers can choose the homesite they would like to have their home built on. Two collections are available in Charleston – The Executive Collection, starting from the $370s, and the Lifestyle Collection starting from the $250s. The Build on Your Lot Program features 41 floor plans ranging from 1,500 – 4,000 square feet. All of David Weekley homes in the Charleston area are built to the Environments For Living® Program’s Platinum Level standards, and are backed by a heating and cooling energy usage guarantee. Under the Environments For Living program, these EnergySaverTM homes are constructed using the latest principles of building science, meaning each home offers energy efficiency, indoor environmental quality and durability benefits. For more information about David Weekley Homes in Charleston, call 800-399-7079. The Whitham model home in Carolina Park - The Village is open daily for tours.